Pia has always known her destiny. She is meant to start a new race, a line of descendants who will bring an end to death. She has been bred for no other purpose, genetically engineered to be immortal and raised by a team of scientists in a secret compound hidden deep in the Amazon rainforest. Now those scientists have begun to challenge her, with the goal of training her to carry on their dangerous work. For as long as she can remember, Pia’s greatest desire has been to fulfill their expectations. But then one night she finds a hole in the impenetrable fence that surrounds her sterile home. Free in the jungle for the first time in her life, Pia meets Eio, a boy from a nearby village. Unable to resist, she continues sneaking out to see him. As they fall in love, they begin to piece together the truth about Pia’s origin—a truth with nothing less than deadly consequences that will change their lives forever. 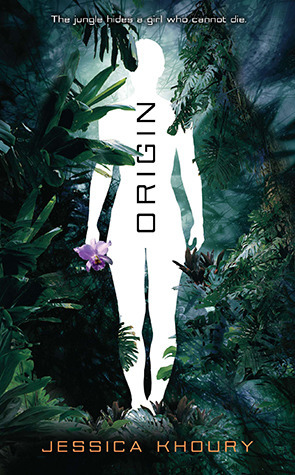 Origin is a beautifully told, electric new way to look at an age-old desire: to live forever. But is eternal life worth living if you can’t spend it with the one you love? Slow in the beginning but once the story picked up the pace, it got exciting and interesting. Origin addresses some interesting issues about science, immortality... the like. The characters were great and the imagery was wonderful. This review was originally posted at Goodreads in August 2014; it has been slightly edited. The beginning was kind of slow, though not frustratingly so. The book started picking up about 20% ago, which is a good thing, but the progress is still kind of lazy. Fortunately we are starting to see some reveals of possible mysteries and secrets that give you a kind of chill (what kinds of mad scientist, creepy lab secrets wouldn't?). This isn't the best book in the world, so far, but I'm not too bothered by it to enjoy it.